Includes sample chapters from Lono Waiwaiole’s Wiley’s Shuffle, Richard Barre’s Bearing Secrets and J.L. Abramo’s Counting to Infinity. Sloan’s back and he is working for redhead Terry Sebring, a beautiful high-class call girl. He is looking for her stolen Jaguar. Her client list was on her Palm Pilot in the car and now her VIP clients are being blackmailed. Sloan quickly recovers the car, but the Palm Pilot has disappeared. Street thugs involved in the theft and Terry’s Johns start dieing. Sloan races to question the people on Terry’s client list before the killer finds them; it looks like one of them has a secret that he is willing to kill to protect. As the mystery begins to unravel corrupt politics and old family secrets are revealed. Sloan has to work fast because cops from multiple jurisdictions are hot on his trail. They want to know why an unlicensed gumshoe seems to be somehow involved in every recent murder in Orlando. Sloan’s Orlando is actually two cities, “ratville” (the Disney World Resort complex) with it’s never ending supply of wide-eyed tourists and the real Orlando where addicts and dealers, hookers and johns, overworked cops, meth snorting trailer trash, mulleted crackers, and the red neck mafia roam the gritty streets and hillbilly back country the tourists never see. Sloan is not one of those brooding, gloomy, endlessly reflective Private Eyes who detest violence. He is a hardboiled loner who hates authority; a guy who prefers action to introspection. He started out with a real job, a wife, kids, two cars, a mortgage, and a dog. He woke up one morning to discover he’d achieved what everyone is supposed to want and lost himself in the process. Now his friends are scammers, hustlers, chop shop owners, and burnt out cops. He drives a ratty thirty year old ‘Vette, lives in a three-room office/apartment above a garage, and takes the jobs Orlando’s licensed Private Investigators won’t touch. Truluck’s characters are originals, which is no mean feat in a genre that often relies on cliché and convention to carry the story. Their slangy streetwise dialog is blatantly crude, gritty, and wickedly funny. Terry Sebring, is seductive and highly manipulative; she feeds Sloan details, names, stories, and veiled hints, but she refuses to show him the big picture. Terry’s clients are an eclectic mixed bag. There’s a compromised software entrepreneur, a retired New Jersey mobster, a scheming accountant, a high-profile local media type, a corrupt lawyer, a paranoid Tele-Evangelist, and a couple old money Florida orange grove owners. Sloan’s sidekick through much of the novel is an exotic and highly competent Eurasian beauty who works security for Terry’s delusional Tele-Evangelist. Sloan’s cop friends, Detective Booker and Sergeant Lightstep chase down leads and reluctantly keep the rest of the cops off his back. Truluck’s prose is refreshingly straightforward, a stream of consciousness first person rap that is unabashedly sexist and ebulliently politically incorrect. The writing is occasionally uneven and the action drags a bit in places, but there are no clichés. The author leans a bit too heavily on coincidence to get him past thin spots in the story’s fabric, but the action is relentless so most readers will forgive him this minor fault. Sloan has a terminal case of all women are virgins, mothers/wives, or hookers and they all need to be rescued syndrome, but stereotyped dames are pretty much par for the course in the P. I. genre. The plotting and pacing are a throwback to the classic pulp P.I. style of the late forties and early fifties. 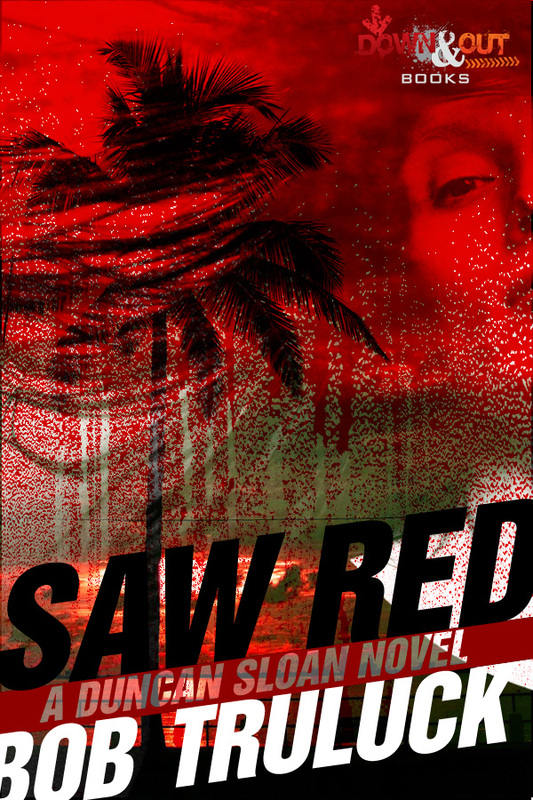 Saw Red is a fun read and Sloan is an engaging if slightly tarnished hero. Readers who prefer Raymond Chandler, Ross MacDonald, and John D. MacDonald style mystery novels may be put off by the profanity, gratuitous violence, and Sloan’s moral apathy, but those who enjoy Dashiell Hammett, Mickey Spillane, Jim Thompson, and Charles Willeford will love Saw Red (and Street Level). Buy if for the Kindle or Nook.